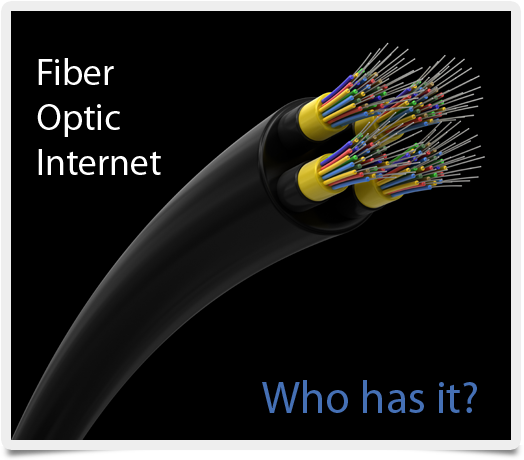 Fiber optic Internet service offers the ultimate in speed and bandwidth for the home user. Unfortunately, its availability tends to be limited; the high cost of installing fiber optic cable being a primary reason. Still, where it is available, it generally leads to healthy competition between the country’s top Internet providers. With that in mind, let’s take a look at three major carriers and whether or not you can get high speed Internet service over fiber from them. Google Fiber is the Internet service on the wish list of many consumers. Its one gigabit per second Internet speed is more than enough to meet the needs of a large family each streaming their own HD movie simultaneously. The price is more than competitive: around $70 per month for Internet only, and $120-140 per month with an added digital TV service. The service first became available in late 2012 to residents in the Kansas City metro area, with Provo, Utah and Austin, Texas also slated to get the service shortly. Google started taking Fiber signups in Austin late last year. In January, Google announced that the Nashville, Charlotte, Raleigh-Durham, and Atlanta metro areas were to be the next metro areas to receive Fiber, with Salt Lake City joining them shortly after. Still, this leaves the vast majority of the country — especially the Northeast — out of luck for the foreseeable future. Verizon offers their own fiber optic Internet service, known as FiOS, which is typically delivered as a bundle with digital TV and home phone. The service launched in 2005 and saw significant expansion up to 2010. FiOS remains available in selected U.S. cities, mostly on both coasts. FiOS expansion slowed due to Verizon’s poor 2010 financial performance, leading them to focus on their more profitable wireless business. The service’s Internet speed ranges from 25 Mbps to 500 Mbps, depending on the tier. As of May 2013, FiOS is available in 18 million homes, with five million current subscribers. AT&T’s U-verse is a mostly fiber optic service bundle with high speed Internet, digital TV, and phone. Depending on the service location, AT&T either runs fiber to each individual house or, more commonly fiber to a node, with copper wire then carrying the signal to each subscriber’s home. U-verse, while not available everywhere, is more common than Google Fiber or Verizon FiOS. With U-verse, Internet speeds vary from 3 Mbps all the way to a one gig service — GigaPower 1G — that became available in Austin, Texas soon after Google announced Fiber was coming to Austin. There is also a different GigaPower tier available in a few cities, but it only offers a 300 Mbps Internet speed. Here’s hoping more local governments continue to get in the ISP game, like Chattanooga’s successful one gig service. In the meantime if you want fiber optic Internet service in your location, you may have to wait until the three big providers bring their networks to your city. Monitor Google, Verizon and AT&T for the latest updates on fiber optic internet availability.